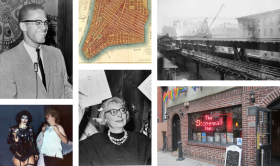 This year marks the 50th anniversary of the designation of the Greenwich Village Historic District. One of the city’s oldest and largest landmark districts, it’s a treasure trove of rich history, pioneering culture, and charming architecture. Village Preservation will be spending 2019 marking this anniversary with events, lectures, and new interactive online resources, including a celebration and district-wide weekend-long “Open House” starting on Saturday, April 13 in Washington Square. Check here for updates and more details. This is part of a series of posts about the Greenwich Village Historic District marking its golden anniversary.